The evolution of the promotional campaign for Shane Black's The Predator has been slow, but rewarding. The very first footage was released and many fans of the franchise were not impressed. There wasn't anything new and nothing really jumped out to grab viewer attention. 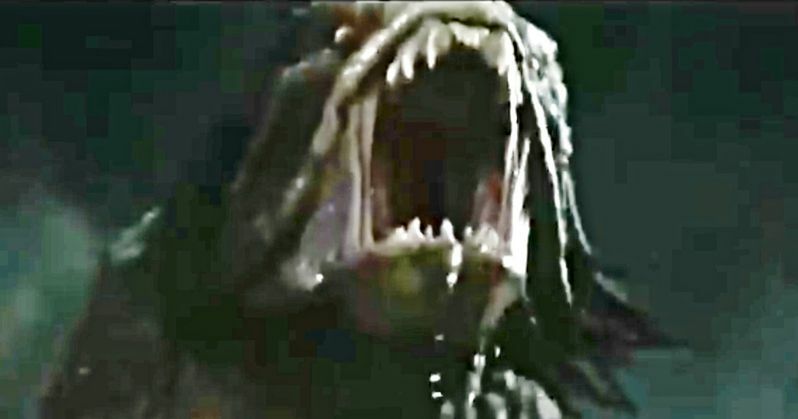 However, each new trailer and TV spot that has been released since, has slowly been stepping up the terror levels, first showing the hunters, then the Ultimate Predator, and now, the Predator Hounds. These Hell-Hounds have been teased in Funko Pop! figures for the last month, but now we have our first scary look at them. The genetic modifications in The Predator didn't stop with the massive Ultimate Predator. The new TV spot for the upcoming film shows off the hybrid Hell-Hound, and it's just as ugly and ferocious as you can imagine. We previously saw these Predator dogs as a cute and cuddly toy, but their on-screen counterparts are anything but adorable. Their teeth are way more gnarly than the set of chompers that their masters have. They could end up being the most horrifying aspect of Shane Black's attempt to bring the Predator franchise back to its roots. The Hell-Hounds aren't a new addition to the franchise, as they were first shown in 2010's Predators, which wasn't really the best movie for these beasts to make a first impression. But, they were recently added to The Predator during reshoots and marks the first time that the canine-like creatures have invaded Earth. The Hell-Hounds are trained to hunt human prey and then wound them, so that the hunter can get what it needs, usually meaning that someone's head is going to get ripped off. As for how the Hounds know to not kill their prey, the hunters have a whistle device that they use to stop them from going all of the way. In a recently released featurette for The Predator, Shane Black promises that his film will be the scariest of the entire franchise. And, as the release date gets closer, it's beginning to look like Black is right. Watching the Ultimate Predator toss around a normal hunter like it's not a big deal is pretty striking. Plus, the featurette also teased a head getting ripped off, which is always pretty intense in the Predator movies. Now, the Hell-Hounds are in added bonus. The TV spot teases them walking in the mist, only to have them jumping at the camera in another shot. Shane Black's The Predator opens in theaters on September 14th, and it looks to be a worthy addition to the franchise. Let's just hope that the movie ends up as good as the promotional material has been lately. You can watch the featurette for the film as well as the new TV spot that gives us our first look at the Hell-Hounds below, thanks to 20th Century Fox.